When I think about the transition to Empire, this is the story that gives me nightmares. It is usually a bad sign when a very short story needs an introduction. Nonetheless, here are some links that might make this piece slightly less obscure. The general historical scenario for this story is that of Spengler's Future. The Contents page for that book is here. Alternatively, you can just read the text and make up your own background for it. I dare you. "Board of Lustration, Hearing No. D5647, Greater Chicago Western District. Is the applicant present?" "Mr. Smith, you have requested this hearing in order to dispose of any suspicions regarding your behavior prior to the Liberation. If your application is granted, you will have unimpeded access to all the privileges of citizenship. As you know, this is not an investigative body. We are limited to the material in the public record and to your own testimony, which is not even sworn. However, you must answer fully any question that the Board may ask. Do you understand? "Please state your name and place of residence for the record." "My name is Winston Smith. Since the firestorm last May, I have been living in a hostel at my place of work." "You are a supervisor at the Ecumenical Dictionary Foundation, are you not, Mr. Smith?" "Yes, Mr. Chairman. In the Orthographic Reform Section. Abstract nouns, mostly." "2 June 2065. In the Year of the Lord." "So you were just 15 years old at the beginning of the Day. Did you move with the Rave before then?" "Were you a regular participant?" "Once or twice a month, before the Militia, I mean." "Were you coerced to join the Rave in any way?" "Did you ever see a miracle?" "How many and when, Mr. Smith?" "Just twice, Mr. Chairman. The first time was at the beginning of Fourth Month, Year 2 of the Eighth Day." "That was a local event?" "Yes, sir. The city returned to normal by the next morning. Of course, I also saw Sixth Month, Year 4. Almost everyone did. By then people expected it." "What did you think the first time?" "I believed the First President. I thought reality was changing." "Some people still think that way, Mr. Smith. That is why we have to hold these hearings for senior civil servants. What do you think of the First President now?" "Do you think he lied about everything?" "Well, he certainly lied about the Eighth Day being eternity. He also lied when he said the only real democracy was direct democracy, with no bureaucracy or hierarchy. What he meant was that he did not want anything to be between him and us." "Do you think he lied about the angels?" "I don't know, Mr. Chairman. I do know that I don't want to see any more angels." "The Board sees that you have several unusual notations in your permanent file. Let's start with the earliest one. Can you explain the entry about the principal at your senior high school?" "We didn't hurt him, Mr. Chairman." "As far as we know, but his neighborhood Rave moved against him and the body was never found. You were on the student council that called the student strike. Would you care to explain the circumstances?" "He just was not enthusiastic about the City of Man. He took down all the American flags after the Day began, but the only City flag he put up was in the lobby. He always referred to the First President as 'Mister.' We just did not see what his problem was. Most of the world belonged to the City of Man; why not our high school?" "Did it occur to you he might get in trouble?" "No, I can honestly say it didn't. Besides, he capitulated immediately. The news hardly mentioned it." "And nobody ever saw him after a week later. Did it occur to you there might be a connection?" "No, I'm ashamed to say." "It was another miracle. That was what the Day was like. People just seemed to organize spontaneously. There was flow, not structure. Nobody gave orders." "Let's move on a bit. You served for 11 months in the Militia of the City of Man during year Four of the Eighth Day. Why not the standard eighteen months?" "I was a communications-technician during the Caspian campaign, Mr. Chairman. That was about the time the standards began to disappear, even in the military. After the campaign ended, my unit just dissolved." "It was more informal than that. The City of Man was everywhere, except for a few caves and jungles. The City was supposed to be self-similar, without a standing army separate from the people. That never applied to the elite units, but it did apply to support units and local auxiliaries. Most of us just made our way home." "You stayed in the area for a while, though, did you not?" "Well, not quite the same area. I studied descriptive linguistics in Jerusalem. That is what got me my present job." "Did you take a degree?" "I did the course work, but I decided against a degree." "I was warned that advanced degrees might soon be regarded as marks of hierarchy." "That was good advice, Mr. Smith. Do you recall who gave it to you?" "Did you move with the Rave at Jerusalem?" "The Rave was prohibited in Jerusalem at that time." "Mr. Chairman, not only did I not participate in the Rave, but I was already beginning to doubt the Day. I have given the Board documentation..."
"One thing at a time, Mr. Smith. Were you in Jerusalem during the incident at the Temple?" "No, I came home to Chicago just a month before. Like most people, I did not even hear about the incident until 2096, when the Years of the Lord began again." "In your application, you allege that you offered some aid to the Ecumenical underground during your stay in the Levant. A few purchases using your personal characteristic continued to be made in Jerusalem until the end of Year Five of the Eighth Day, months after you returned home." "Yes, Mr. Chairman. I had made some friends in the underground; I saw no reason not to give them limited use of my credit." "The Board notes, Mr. Smith, that all the Ecumenicals who might have used your characteristic disappeared during the Desolation, and are presumed dead. We also note that you filed a police complaint alleging identity theft in connection with those purchases." "I had to maintain a cover story, Mr. Chairman. I don't claim to have been a hero. It was the least I could do." "I see. Well, moving on, after you returned to the Midwest, you worked as a technical editor for the Chicago Tribune. Your records were destroyed during the firestorm. However, we do have a copy of the resume you submitted in Year 7 to the Word Collective, as your current employer was then called. In the resume, you make special mention of your movement with the Rave at the Tribune. You even give a list of persons against whom the Rave moved. Would you care to comment?" "As you know, Mr. Chairman, the Rave by then was not really voluntary, especially not at a prominent media outlet. You will note that I never called a gathering. Certainly I never informed on anyone." "It's a one-page resume, Mr. Smith. You don't give any specifics but the names. In any event, the list could not be complete. The Rave there moved frequently." "It moved back and forth, Mr. Chairman. One month it moved to stamp out discrimination between all forms of life. Not long thereafter, it moved to support the 'single species' principle against food processors who took non-discrimination too literally. The names I listed were of people who seemed unlikely ever to be rehabilitated." "Why did that seem unlikely?" "They were guilty, of ordinary corruption and things like that." "Very prudent, Mr. Smith. There is just one item about your time in the dictionary division that the Board has a question about. According to the office journal for 6 Second Month Year 14, the First President visited your office and spoke to you personally. Would you care to elaborate?" "The Board cannot be serious. That was a dream. Lots of people imagined things like that, all through the Day. In any case, the Collective often did visualizations; the journal might just have noted the theme of one." "Some people still have these dreams, Mr. Smith. Sometimes there is still independent corroboration, five years after the First President's death. It is the policy of the Ecumenical government to investigate all sitings with any corroboration that occurred during his lifetime, however improbable. So, what did you say to him, Mr. Smith? And what did he say to you?" "The Board is asking me to remember a hallucination." "The recollection isn't very clear, Mr. Chairman." "Did he just say hello? Did he ask about your family? Did he talk about your work?" "I can't even say whether the exchange was short or long. Most of what I remember was just friendly-boss stuff: How do you like the department, that kind of thing. Some of it was very specific, though." "Well, he seemed to know everything I knew about lexicography. That's how I know it could not have been real." "Did he say anything to you about the Day, Mr. Smith?" "Nothing unusual, just typical City of Man propaganda from late in the Eighth Day, when things were starting to come apart." "Please tell us exactly, Mr. Smith." "He said there was no need to worry anymore, that I would always be with him in the City of Man. He said that, in the end, I would see nothing but the Eighth Day. What happened in ordinary time could no longer change that." "And what did you think of that, Mr. Smith?" "I thought it didn't happen. Even then." "And if it did happen?" "Then it was a lie. It was a lie whether it happened or not." "I think that is all we need to hear about the matter." "We have no documentation at all about you between 2096 and the filing of your lustration application at the beginning of this year. That's not unusual; lots of things were lost during those three years. Do you have any comment about the period, Mr. Smith?" "I think there are some things about the last 20 years we all want to lose, Mr. Chairman." "The Board will probably concur, Mr. Smith. We'll let you know. This hearing is adjourned." Imperialism is a subject John often returned to, but his interest in the subject was quite different from most others. For John, what mattered were not mere national empires like the British Empire, but the Empire, the universal state into which all political and economic systems seem to eventually collapse. Even though the process can be justly described as a collapse, it is not primarily negative. For example, one of the reasons the political order collapses into an empire is that the stakes and pressures of governance have become too high for society to bear. The empire is seen as an improvement by most of its subjects; it is genuinely popular. Despite the differences between an empire and the Empire, you can still find some interesting features of the British Empire that may be reproduced in the coming universal state. For example, the British Empire was cheap, in terms of both money and men. It was also relatively tolerant, and preferred local control whenever possible. There are also some features that probably wouldn't work well. The British Empire was an extension of national ambition. The universal state is the oecumene, the abode of man. As such, purely national ambition no longer has a way to even be expressed. There are no separate countries, although there might be rebellious provinces. The universal state is also usually not very dynamic. All of the civilizational energy has already been expended creating the universal state, everything you have is everything you'll get. The British Empire at its best was exceptionally dynamic. At this point, the real question would be how Western will the universal state be? John wrote some interesting speculations about this. We shall get to them in time. The British Empire had a solid genesis in government-licensed piracy. The Spanish in the 16th century beat the British to the plunder of the major civilizations of the New World, leaving the British no recourse but to rob the Spanish. Still, even at that point the British displayed some hidden advantages. The English government was not centralized enough to simply expropriate the funds from its citizens to do its own empire building. By preference, it privatized British activity abroad, both commercial and military. As time went on, England outgrew piracy and turned to the licensing of the great trading companies. The greatest of these, the East India Company, was running India by the end of the 18th century. Strangely, the Honorable Company got India as a booby prize; the Dutch East India Company got the originally far more profitable East Indies. Even so, all that the Company's charter conveyed was a monopoly right to British business with India, provided the Company could do any. They wound up governing the place only because the Mughal empire unraveled in the 18th century; if the Company was going to enjoy any security, the Company would have to provide its own government. In addition to piracy, there were drugs and slavery. Ferguson gives us a judicious helping of statistics about the “sweet tooth” economy of the 18th century Atlantic. Britain's possessions produced sugar. They also produced coffee, tea, and tobacco. All these things are mildly addictive stimulants. The market for them was bottomless, and the labor for them was largely unfree. Readers may be surprised to learn quite how lethal this labor system was. It is well-known that one out of seven of the prisoners on slave ships died in passage, but the death rate for the crews was even higher. The islands of the Caribbean were immensely profitable; the exports from Jamaica alone were worth more to England than the whole of the exports of America at the time of the Revolution. That was one of the reasons the British decided to let the colonies go. However, the populations of these tropical colonies, slave and free, did not reproduce themselves. Most immigrants from the British isles died soon after arriving, and it was to the Caribbean that most of them went in the 17th century. Nonetheless, even at its most amoral, the “First British Empire” of pre-Victorian times was a “liberal” empire, if not quite an empire of liberty. It was very keen on the rule of law, particularly law as it related to property rights. American colonial complaints against London really came down to the argument that one's property is not really secure without some say in how much it is taxed. The empire was also tolerant, sometimes shockingly so. The government in London and the trading companies had no interest in spreading Christianity; they also no objection to customs like widow-burning, provided the subjects of the empire kept it to themselves. Imperial libertarianism sometimes extended to disinterest in famines in the areas the empire controlled. On the positive side, the people who administered the empire were sympathetically curious about the cultures where they worked. They adapted to them, cultivating their arts and literature. As a rule, the British co-opted local elites: there was no color bar to social interaction, or even marriage. Some of this changed with the transition to the “Second Empire” of Queen Victoria's time. The empire became more humane as it became less tolerant. Much of this occurred under the influence of the evangelical revival of the late 18th and early 19th centuries. The evangelicals on both sides of the Atlantic fought slavery, with greater and much earlier success in the empire. (In America, the effort was stymied after abolition in the northern states; Ferguson suggests that the success of the American Revolution delayed the end of slavery in America by at least a generation.) Despite the protestations of old India hands, the East India Company did begin to make a fuss about widow-burning and female infanticide. The rule of the Company itself was replaced by paternalistic political control from London after the Mutiny of 1857. The imperial government promoted education, public works, and public order. The settlement of Australia was a Monty Python parody of a whole society organized as a Victorian reform school. It was also a rousing success. The British role in the “scramble for Africa” in the last quarter of the 19th century began at the behest of evangelicals, to suppress the Indian Ocean slave trade to the Middle East. In the 1890s, the last decade of Queen Victoria's reign, the empire was at the height of its power and self-confidence, though not yet of its territory. It controlled a quarter of the world's land surface and roughly the same proportion of its population. Its control of the oceans was uncontested. In Ferguson's estimate, it was the closest thing the world has ever seen to a world government. The empire was characterized by a high degree of local autonomy. Even India, ruled by an autocrat appointed by London, pretty much ran itself. As for the white dominions, they got almost anything they wanted in terms of “responsible self-government” after the 1830s. The imperial center made a point of protecting the rights of aborigines throughout the empire; the chief audience for Darwinian racism was among the colonists on the periphery. The empire supported free trade: sometimes at gunpoint, and not always with happy results, as the Opium Wars illustrate. Be that as it may, in this laissez-faire empire, the imperial bureaucracy and military were fantastically small. There were fewer than half-a-million members of the armed forces at the empire's height, including the Indian Army. With few exceptions, colonial wars were small, quick, and resulted in few British casualties. There were no more than a thousand members of the “covenanted” India Civil Service, the people who actually ran India. That number is a bit misleading: Imperial India had a fairly large public sector. It was staffed largely by Indians, including some who passed the exam to enter the covenanted Service, just as the bulk of the military in India was Indian. Because the regions of the empire were normally self-sufficient, the structure was cheap for Britain: military expenditures late in Victoria's reign came to 2.5% or 3.0% of net domestic product: not so different from British defense expenditures in the early 21st century. Imperial mysticism and liberal disgust with the empire arose at about the same time. Kipling and Ruskin and Baden-Powell (founder of the Boy Scouts) saw the empire as a chivalric enterprise, the chief pillar of a civilization that made the world better for everyone, everywhere. This was also the view of Cecil Rhodes, the imperial entrepreneur. Ferguson does not dwell on the historical significance of the Anglophile network that Rhodes promoted, though he does note that Rhodes hoped his scholarships would create something like the Jesuit order, with the empire substituted for the Catholic religion. The problem was that the Boer War he provoked was nakedly commercial and not at all cheap, in British lives or in any other way. That event began the turn of enlightened sentiment away from empire. It would accelerate in the 20th century, until the very word “imperial” became a term of opprobrium. The key to Ferguson's assessment of the empire is his analysis of the circumstances under which it ended. In the first half of the 20th century, the real alternatives to the British Empire were the Third Reich, or the Japanese East Asian Co-Prosperity Sphere, or the Italian Empire, or even the Soviet Union. Fighting off these alternative and far worse empires justified the British Empire's existence. Similar arguments could be made for earlier periods in the empire's history. The alternative to British India would have been a morbid extension of Mughal India, which would have been no more successful than Manchu China during the same period. And what about the other colonial empires? The French were serious rivals in India and North America until the Seven Year's War (1756-1763). The Dutch actually got the better of the British during several conflicts in the 17th century; the competition was ended only when the Dutch and British executives merged in the Glorious Revolution (1688). 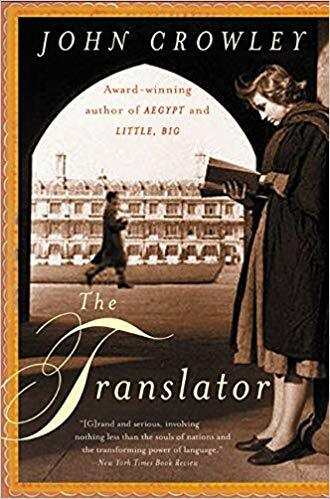 It is possible to imagine a history dominated by a far greater French Empire, with its whitewashed architecture and frigid bureaucratic routine. One could imagine the same of the Dutch Empire, with its single-minded devotion to business. In either case, the British idea of liberty would have been largely absent from the modern world. Ferguson tells us that all the post-colonial states with populations over a million that became democracies are former British colonies. The qualifications in that statement are intriguing, but Ferguson may be onto something. Certainly the regime of free trade that Britain promoted in the decades before the First World War made the world a more economically dynamic place. Ferguson makes some interesting comparisons between that “First Age of Globalization” and the Second, which he dates to the last quarter of the 20th century (and which he evidently believes is over). Though he does not argue the case in detail, Ferguson suggests that it would be hard to condemn 19th-century colonialism as merely exploitive. The colonial powers made huge infrastructure investments in their colonies. (The Congo Free State of King Leopold the Wicked may have been the chief exception.) India had a small trade deficit with Britain, for instance, but British India was a capital importer. During the Second Age of Globalization, in contrast, most trade and investment moved between developed countries. The income gap between the developed and undeveloped world widened during the Second Age, whereas it narrowed during the First. Then there is the phenomenon of political fragmentation. The number of independent states tended to decline during the 19th century; around 1910, there were just 51. At this writing, the number is just short of two hundred. The new polities, fragments of old empires, often have tiny populations and economies that don't make much sense in isolation. Nonetheless, each must support the whole apparatus of national government. In the former Soviet area and in Africa, many of them plainly are not up to it. The implication of Ferguson's description is that what the world really needs is for some power to do in the 21st century what Queen Victoria's empire did in the 19th. One may note in passing that Ferguson believes Britain itself might still have done at least part of this, in a slightly different history. There was talk well into the 1950s of a “Third British Empire,” under which the Commonwealth would function as a federation. There were several reasons this did not come off. One was that the United States was not particularly helpful during the Sterling crises that punctuated the post-war years, thus encouraging the trade patterns of the old empire to break up. Also, the Commonwealth became so big and diverse that it no longer meant anything. A federation of just the white dominions might have worked, in the unlikely event that its non-British members could have been persuaded a Third Empire was in their interests. As things turned out, the only power left to take up the imperial slack is the United States, about which Ferguson has his doubts. In some ways, America is better positioned for global empire than Britain ever was. The US economy is about a quarter the size of the global economy; Britain at its height represented about 8%. Even at the empire's height, there were theoretical combinations of navies that might have challenged British naval supremacy, and of course Britain did not purport to be a great land power. In the early 21st century, the US has something close to a monopoly of supremacy in every dimension of conventional force. And the US manages to do this with not much more of a percentage of the national product than Gladstone or Disraeli's governments used. One might also add that Ann Coulter is much better looking than Queen Victoria ever was. The problem is that, in some ways, the US position in the world is the mirror image of a proper empire. Ferguson does not use this analogy, but he might have likened the “American Empire” to the successful Japanese exporting corporations of the 1970s, those uncanny enterprises whose capital structures consisted almost entirely of debt. Quite aside from chronic federal deficits, the US seems to have given up on ever running a positive trade balance again. The country is an immense importer of foreign capital. It is also an immense importer of foreign people. One of the characteristics of the British Empire at every stage was Britain's huge emigration, which created whole new countries. Americans, in contrast, are reluctant even to go abroad on short business trips. As for military power, the American ability to project it is at least matched by the American eagerness to withdraw it just as soon as possible. In fact, the US tends to withdraw before it is possible, or at least prudent. The Widowed Queen would not have been amused. To Ferguson's critique, I would say this: I like history as much as the next guy, indeed considerably more than most next guys. Pirates, the Raj, explorers, habeas corpus, the Boy Scouts, the RAF: they are all part of quite a story. Ferguson may well be right that it is the story of one of the better possible worlds, if not necessarily of the best. Still, the story is history, just as the age of empire is history. Empire, in the sense that Ferguson uses it, is a projection of the nationalism of some nation or other. The great national empires, like the great absolute monarchies, were possible during only a limited epoch. The United States in the 21st century could not create such an empire, even if it were foolish enough to try. What the United States can do is anchor a Universal State or, to use Toynbee's other coinage, “an ecumenical society with Western characteristics.” The story of the better-possible-world that the British Empire created may yet continue. The trick is to avoid the temptation to emulate the noble empire's example too closely. Another counterfactual history, but this time one meant as entertainment. I haven't read this book, but I may get around to it at some point. “I care only if it is effective on the page. I agree with the late Ernest Newman: a great score is more finely realized when one reads it in the tranquility of one's study than when one sits in a crowd and endures the ineptitudes of orchestra and singers. Anyone can write an essay describing a history that diverges from the real one. Many people have written novels premised on counterfactual histories. For Want of a Nail is a real rarity, however: a textbook that treats 200 years of history that did not happen as if they did. It has not just footnotes to imaginary books, but a whole bibliography of imaginary references. The author, the noted economic historian Robert Sobel, must be numbered with Tolkien among the handful of creators of a complete imaginary world. (He actually does Tolkien one better by writing himself into his imaginary world: For Want of a Nail also purports to be written by an economic historian named Robert Sobel. Several of his works are cited in the bibliography; their titles are almost but not quite those of works by the real Sobel.) In fact, the book is so well done that it may stand as a caution for all writers of alternative history: counterfactual academic history is unlikely to be as interesting as an academic treatment of real history. 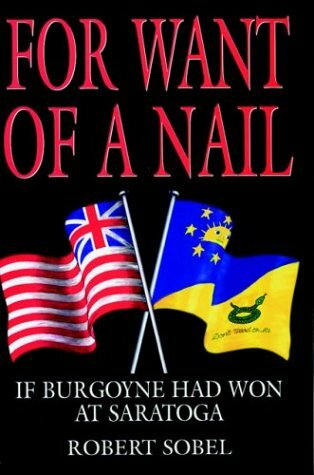 For Want of a Nail will often remind readers of Niall Ferguson, another economic historian who has speculated at length about what would have happened had the American Revolution failed. The short answer to that question has always been, “We would all be speaking English.” There is more to be said, it seems. The author starts the divergence, reasonably enough, with the loss by the insurgents of the Battle of Saratoga in 1777. In this history, the British commander John Burgoyne is reinforced at the last minute by the garrison in New York City. The strategic effect of the battle (actually several engagements in both the real and alternative scenarios) gives the British control of the Hudson River, thereby cutting off New England from the middle and southern colonies. More important, it causes the French to lose interest in supporting the insurgency. After suffering further defeats, Washington is relieved of his command, but the Continental Army continues to disintegrate. Congress, driven from Philadelphia, soon sues for peace. In the aftermath, the most prominent would-be Founding Fathers are hanged (weasely old Benjamin Franklin escapes by virtue of having helped to negotiate the surrender). However, the British are generous with amnesty. The younger rebel leaders, people like Madison and Mason and Hamilton, survive the defeat, and set out to found their own nation in Spanish territory. The Wilderness Walk of 1781, to found the state of Jefferson in the region that might otherwise have been Texas, becomes the creation myth of a new society. No one had really expected the American rebellion to succeed. The British saw the incident as largely their fault: they had neglected to establish a constitutionally coherent system of self-government within the empire for their North American colonies. The result is the Britannic Design, which divides British North America into several confederations. At first, these are only loosely linked under a viceroy. (The first of these is John Burgoyne himself, by then called Lord Albany.) Partly in order to facilitate internal improvements, and partly because of the growing military threat from the southwest, these confederations are more closely linked in the 1840s, becoming the Confederation of North America (CNA). The CNA has a parliamentary form of government (so do its constituent confederations); the head of state, called the Governor-General, is majority leader of parliament. Though London continues to appoint viceroys, the CNA's relationship to the British Empire becomes merely symbolic by the second half of the 19th century. At no stage does British North America extend to the Pacific: Alaska, at first a Russian territory, divides the wealthy Confederation of Manitoba from the ocean. (Manitoba is also notably flaky; imagine California compounded by British Columbia.) Thanks to a war with France at the end of the 18th century, the CNA also includes the territory between the Mississippi and Missouri Rivers. However, after a series of counterfactual wrangles as tedious as the real ones, Quebec eventually becomes simply an “Associated Territory” of the CNA. Nova Scotia always is, for reasons that are never explained. Meanwhile, in the southwest, the frustrated republicanism of the former colonists takes a form that echoes some of the ambitions of the leaders of the Confederacy in the real world. 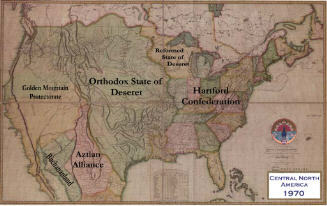 The new state of Jefferson soon secures its independence from the Spanish Empire, already on the verge of dissolution. Then the few tens of thousands of emigrants go through a scale model of the constitutional debate in our history. (Hamilton is a co-author of a no-doubt insightful work, Federal Governance.) By 1793, they have a compromise constitution inspired by Montaigne, but with a few novel features, such as a plural executive. The constitution also tolerates slavery, which the founders believes would soon die out because it is uneconomical. Then the cotton gin is invented, giving the institution a remarkably long lease on life. History in that region does not really diverge very much until a few years later, however, when Jefferson intervenes in a Mexican Civil War. Sobel is sparing of the use of real people in his counterfactual history. The only one who plays a major role is Andrew Jackson, the principal leader of Jefferson, who founds the United States of Mexico (USM). He becomes its first president in 1821. The USM has a federal constitution very similar to that of the erstwhile USA. However, it has an even more complicated ethnic composition: Anglos and “Hispanos” (Iberian Mexicans, presumably) constitute the ruling stratum, but there are also Mexicanos (ordinary Mexicans); Indians (who in this case have two states more or less to themselves), and the slave population. The country survives because Jackson makes the people of Jefferson identify themselves as Mexican, but conflict among these groups is one of the engines of USM history. As originally constituted, the USM includes Mexico, the Rocky Mountain region and the Pacific Coast up to the northern border of California. In a war with Russia in the late 19th century, it acquires Alaska. In fact, at that point the country is in the hands of a colorful megalomaniac, who also conquers part of Siberia and the whole of what we know as Columbia. Readers interested in a recitation of the whole timeline should get the book. In the CNA and USM, Sobel has sorted out the two strands of American nationalism and created different countries for them. The CNA got the utopian impulse. Its history is chiefly a tale of social reform and quixotic experiments in economic equality. This goes beyond the Canadian ideal of good government; it is as if the Progressive Party had half a continent to itself. The CNA is also pacifist; its only foreign war is an indecisive conflict with the USM in the 1840s. In fact, its policy of neutrality during the 1930s is widely blamed for preventing deterrence of the one and only Global War, which occurs in the 1940s. In the '50s, the CNA's immunity from war damage creates a politics of “war guilt.” A Governor-General oddly reminiscent of Jimmy Carter in the real world then governs the country, though For Want of a Nail was written long before the Carter Administration. The USM, in contrast, got the “Jacksonian tradition” along with Jackson himself. This is the strand of American political culture that is very keen on liberty and indifferent to equality. It is also the strain that brought the real world “Manifest Destiny” (in the USM, it's called “Continental Destiny”). The USM is not quite a pure villain in this history. Its lapses from republicanism are not produced by Jacksonianism, in fact, but by a convergence with ordinary Latin American caudilloism. Nonetheless, the USM does not get around to abolishing slavery completely until about 1920 (it's done by a no-nonsense ex-general) and the country does cause more than its share of trouble in the world. 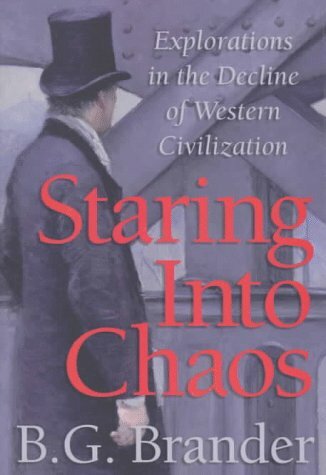 Sobel has succeeded in suggesting a plausible modern world that never experienced the great ideological divides of the 19th and 20th centuries. Partly because the American Revolution fails, the French Revolution never amounts to more than a minor Parisian uprising. The French monarchy survives until 1880. No French Revolution; no Napoleon; one wonders whether there was a Hegel. A Marx is indeed mentioned briefly, and there is even a tradition of radical socialism. However, this aspect of politics is muted. There is no equivalent to the Soviet Union in this history, and no fascism, either. The Global War breaks out in rather the way that the First World War in the real world did, through ordinary Great Power ambition acting on an alliance system that is too big and too rigid. As an economic historian, the author treats us to several depressions, two in the 19th century and one in the 20th. His heart, one suspects, is in another of his creations: Kramer Associates. This is a multinational corporation that starts in the USM; the basis of its early power is the oil industry, though it soon branches out into every kind of manufacturing. It dominates the USM's economy and foreign policy in some periods. It is largely to secure the company's gold discoveries in Alaska, for instance, that the USM conquers Alaska. On the other hand, Kramer Associates distances itself financially and geographically from the USM as that country's political system becomes less predictable. The company shifts its headquarters to Taiwan. In order to prevent a renewed outbreak of the Global War, the company invents and detonates its own nuclear weapon, thus initiating a regime of strategic deterrence. Now there's a poison pill for you. There are some technological divergences from the real world. Television (“vitavision”) makes its appearance 30 or 40 years early, while automobiles with steam engines (“locomobiles”) are still the dominant form of private transport until the 1930s. Perhaps to save the trouble of making up the names of counterfactual inventors, Thomas Alva Edison is credited with inventing essentially everything. One cannot praise too highly the verisimilitude of this counterfactual history. It reads just like a college history text, and not a boring one. As for the scenario, there is little point in arguing against the details of a counterfactual history. (At least, this is true for counterfactual history intended as entertainment: higher standards obtain when a historian is trying to determine what real alternatives faced the decision makers in a particular incident.) So, I will confine myself to suggesting that a precocious experiment with dominion status for North America would not have succeeded. Britain actually did try something like that with Ireland after the American Revolution. The island proved so disloyal that the experiment was terminated; the ancient Dublin Parliament was abolished in the last Act of Union. One might argue that this would not have been a problem with the North American confederations, because there would have been no French Revolution to incite unrest. Maybe, but it is likely that the Americans would have remained perfectly capable of inciting each other. In any case, to the extent this book has a conceptual flaw, it is not the scenario. The problem is that this history has a single author, while real history is an anthology; the contributors are all the people who live during that history. The limits of the author's imagination make a floor to villainy and a ceiling to genius that are lacking in the real world. In the 200 years covered by For Want of a Nail, no says anything as interesting as “Thou shalt not crucify mankind upon a cross of gold,” or “The only thing we have to fear is fear itself.” Neither is a particularly brilliant turn of phrase, but one man is unlikely to coin both. The fundamental reality is that Earth is Eurasia. The important parts of Eurasia are its extremities. The rest of the world's territory is important only as it relates to the ancient civilizations that exist on the supercontinent's eastern and western ends. America is endangered if either of these peripheries becomes aggressive, or falls under the control of a hostile power of the interior. Preventing these things from happening is what American statecraft and armed forces exist to do. Everything else, absolutely everything else, is optional. Probably we can do without a general field theory of U.S. foreign policy. At any rate, it would not be a good idea to run the country's foreign affairs according to one. Nevertheless, there should be certain things that are obvious to everyone about America and the world. You don't have to be very familiar with today's opinion leaders to realize this is not the case. Jack Beatty at the Atlantic Monthly thinks that the end of the Cold War frees us to demobilize. Michael Lind at The New Republic supports the single-minded pursuit of national interests. For that matter, Bob Dole speaking before the World Affairs Council in June of 1996 seemed to think that what U.S. foreign policy needs is "men, not measures." It is hard to think of three establishment figures with more different views generally, yet in this area they all still manage to miss the point in almost the same way. The point is this: American security is a function of the state of the world. It does not depend on the state of American culture or the competitiveness of the American economy. Such things may determine our ability to do what we have to do. However, the domestic life of America does not define our international needs. Naturally, just because we need to do something, it does not follow that we will be able to do it. One can conceive of a world so hostile or chaotic that no level of American mobilization would make us physically safe and let our society flourish. In such a case, some commentators might be tempted to speak of an America that had turned its attention homeward. The reality would be an America that had ceased to be a subject of history and had become an object. The "state of the world" is not like the state of the weather. It is defined by physical and cultural geography, and it changes far more slowly than daily newspaper readers are apt to think. The fundamental reality is that Earth is Eurasia. The important parts of Eurasia are its extremities. The rest of the world's territory is important only as it relates to the ancient civilizations that exist on the supercontinent's eastern and western ends. America is endangered if either of these peripheries becomes aggressive, or falls under the control of a hostile power of the interior. Preventing these things from happening is what American statecraft and armed forces exist to do. Everything else, absolutely everything else, is optional. As a practical matter, the pursuit of this strategy means maintaining the outcome of the Second World War. The gaggle of international bodies created by 1950 were designed to do this. The U.N. is simply the alliance that won the Second World War, preserved in amber and surrounded by a rabble of international social workers. The other institutional monuments from that era, the International Monetary Fund and NATO and the General Agreement on Trade and Tariffs (which finally achieved its originally intended form in the World Trade Organization) are similarly American inventions. There is no "international community" to which the United States must defer or against which it must defend its national interests. To the extent there is an international system, it is an American artifact. You neglect its maintenance at your peril. As a theoretical matter, the nature of this international system was not determined by the Cold War. The combination of the rise of Soviet power and the successful defense against it was simply a particular instance of the system at work. The American interest in a secure Europe and East Asia antedated the Cold War and continues after it. It would have required something like the same level of American engagement even if the Soviet Union had never existed. It requires a comparable level of American engagement now. This is all you absolutely have to know to keep American foreign policy on-track. Still, there are some other points you might want to keep in mind. For instance, be wary about trying to whittle down U.S. defense commitments to "vital interests." A vital interest is something that, if you don't have it, you are likely to die. A country that will fight only when its vital interests are at stake will only fight when it is fighting for its life. This is not a good idea. Also, beware the notion of the inevitability of a multipolar world. It is based on the false assumption that any political entity will act as a world power as soon as its economy achieves a certain relative size. In reality, not everything is possible to a culture at every point in its history. People who think that today's China is just a larger version of Wilhelmine Germany are in for a surprise rather like that experienced by the enthusiasts for the European Union. When I did the site upgrade, John's online book, Spengler's Future, got jumbled up because I had it hosted on separate pages. I rolled everything up into one page, and added it to the navigation bar. For so simple an attempt, this actually worked pretty well. This approach is a quick and dirty way to see the kind of parallels in history that have inspired the many attempts to make cyclical models of history. Go check it out, it is worth a read. Since I just watched Amazon's pilot episode of the Man in the High Castle, I'm in an alternative history mood. 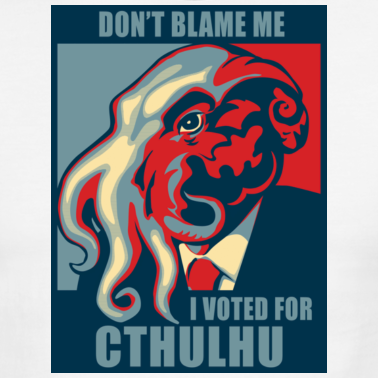 Don't blame me, I voted for Cthulu. 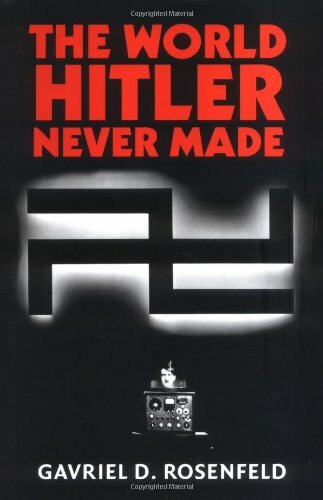 Some years ago, I read a novel with the title, The Iron Dream, which purported to be science fiction written by Adolf Hitler in an alternative history (who the actual author was I do not remember). In this history, there was a Communist coup in Germany in the early 1920s, and Hitler became just another exile. (His brief involvement in reactionary politics was not worth mentioning.) He settled in the United States, where he became a commercial illustrator for pulp magazines. He took to writing for the pulps as his English improved, eventually attracting a small literary cult. He charming Viennese manners made him the star of science fiction conventions. His major novel, The Iron Dream, dealt with a political movement in a post-apocalyptic world. The movement was dedicated to cleansing the gene-pool of mutations and destroying the great mutant empire in the East. While some people detected anti-Semitic undertones in the book, Hitler's defenders noted that many of his best friends were Jewish. After his death, his stories were frequently reprinted in paperback editions, often using his own illustrations. Howard Phillips Lovecraft (1890-1937) has a biography one might expect of a failed Hitler. Lovecraft has suffered from more than his share of posthumous Freudian analysis, but it is true that his family history (father dying while Lovecraft was young, over- protective mother) is similar to Hitler's. Both their childhoods' were prologues to some some similar life-long characteristics. Lovecraft, like Hitler, was a marginal artist. He was a better writer than Hitler was a painter, though that is not saying much. Both were very briefly married, Hitler for just a few hours, Lovecraft for a few months. Both were interested in the occult to some degree. Certainly both Nazism and Lovecraft's fiction owe a great deal to Theosophy. (Lovecraft claimed to be a sceptic. Hitler was affected by ideas of this type, though he was not a believer to the extent that Himmler and Hess were.) Both were racist Social Darwinists of the sort who viewed history as primarily determined by racial factors. Both were hypochondriacs who repeatedly forecast their early deaths. Lovecraft, whose neurasthenia kept him out of the First World War, turned out to be right. In person, both were rather shy and formal, not hard to like. Hitler loved dogs, Lovecraft loved cats. Imagine an alternative history in which Lovecraft's ideas did not remain the stuff of pulp fiction. Suppose his father had lived, or he had been orphaned, or his family finances changed so that he had to go to work early in life. He becomes, let us say, a journalist in Boston or New York. He might then have fought in the First World War and returned with a distinguished record. He becomes a nationally syndicated columnist, famous for his warnings against the threat of immigrants, Communists, and unbridled finance capitalism, particularly as associated with the Jews. Like many practical people, life experience could have changed his reading about the occult from entertainment to belief. (It happens. Look at W.B. Yeats. 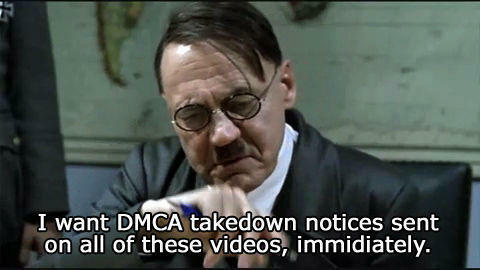 For that matter, look at Hitler.) In the social catastrophe of the Great Depression, he would have had a unique opportunity to implement his ideas for revolutionary reform. Lovecraft in politics would not have been a "conservative" in any serious sense of the word, though he would certainly have had little use for socialism or democracy. Sinclair Lewis, in his 1935 novel "It Can't Happen Here," tried to give some notion of what an American fascism might be like. It would be more puritanical than its European counterparts, he suggested. It would be less a case of a party imposing a political orthodoxy on the whole country than of radical right groups, such as the Klan, being empowered by the government to act at the local level. When Lewis thought of fascism, however, he seems to have been thinking of Italy. There was no particular place in his fascist America, as there was in Germany and would certainly have been in Lovecraft's America, for a national eugenics program. For that matter, Lewis did not understand, at least in 1935, how central anti-Semitism was to Nazism. If, as some writers have suggested, Hitler's Jewish policy was a necessary feature of his model of history (See Paul Wistrich's Hitler's Apocalypse), then one would expect similar notions to occur to Lovecraft, whose intellectual frame of reference was not so different from those of the leading Nazis. America did not lack for proto-fascists in the 1930s, but they were regional personalities with little hope of forming an important national movement. Huey Long of Louisiana was very smart, of course, but he was, well, too "colorful" to be much appreciated outside his home state. Father Coughlin, the Radio Priest, would not himself have been a serious candidate for political office. His movement was too closely linked with Rome, at least in the public mind, to be anything but a faction in a larger right-wing coalition. Lovecraft, or someone like him, might have been able to form such a coalition. A Northerner, nominally Protestant, he could have preached economic populism for the South and Midwest and anti-Communism for the Catholic Northeast. His background was such that he would have been more likely to have entered politics as a Republican than as a Democrat. In his native New England, the Democrats were the party of the hated immigrants. Of course, he might have taken the posture of a man above politics before the Depression. Like Perot in 1992 or Powell today, he could have had his pick of the nomination of either party. In terms of party platform, there was not much to choose between Roosevelt and Hoover in 1932. Roosevelt's chief qualification was that he was not Hoover. Lovecraft, who was in real life of a somewhat philosophical cast of mind, would have been not just a new face, but a man with a plan. Any government elected in 1932 would have had to do much the same sort of thing on taking office that Roosevelt did. It was necessary to immediately reconstruct the banking system, to distribute disaster relief to the unemployed, and to try to cajole the country's businessmen into maintaining employment and making some investments. The Roosevelt Administration did this minimum, supplemented a little later with "make-work" projects, from new roads to the vaguely Stalinist murals you can still find in some older Post Offices. Some of these initiatives helped. Some, such as the government's price-fixing schemes, were catastrophes. In any event, though the economy improved in the 1930s, punctuated by various declines, the Depression was not finally ended until the United States began to mobilize for the Second World War. In this the US was in sharpest contrast to Nazi Germany. Hitler came to office about the same time Roosevelt did, and the economy was humming again within two years. The reason for this was simple enough: Hitler took office with the intention of fighting several major wars in about five to ten years, so rearmament began immediately. President Lovecraft, one suspects, would have done likewise. Indeed, such a policy would have been self-sustaining, since possible enemies would have multiplied. The Roosevelt government was economically nationalist in terms of tariff policy, but it was content to let the international market economy continue to exist. It did not, at least to my knowledge, impose foreign exchange restrictions, or make it nearly impossible for foreigners to own property in America. Fascist governments, however, generally did do things like this. Such measures would have been serious blows to England and the Netherlands, whose people have always invested heavily in America. England would soon have perceived more than a financial threat, since an invasion of Canada would certainly have suggested itself to Lovecraft's government, both for strategic reasons and as an exercise. An Anglo-American naval war might have been the prelude to the western half of the Second World War. That there would be a Second World War is hard to doubt, but the alliances would have been different. Britain, bereft of its overseas assets and a large part of its fleet (assuming the US won), could have had a revolution in the 1930s. If it was to the right, then the country would have been neutral in the event of a Nazi invasion of France. Fascist Britain might also have maintained its alliance with Japan through the 1930s, which would have meant the US could still have faced a two-ocean war when the fight with Japan started. Indeed, the US might have been faced with a Anglo-German alliance in the west. This would have made attacks on the continental United States plausible, particularly from the air. On the other hand, if Britain's revolution was to the left, then the British Empire would have disintegrated catastrophically. Red Britain might then have supported France in 1940, or whenever the German invasion came, but would probably have lacked the naval and air strength to resist invasion itself. Without Britain as a conduit, it is unlikely America would have become involved in Europe in the 1940s. In the Pacific, hostilities might have begun as they did in the real world, but would have ended differently. For instance, since the United State would not have been cooperating with Great Britain on secret projects, and since America would not have been an attractive haven for refugee scientists, the atomic bomb would not have been invented. Despite what the revisionists say, an appalling invasion of Japan would almost certainly have been necessary. Lovecraft's government might then have been less interested in reforming the country than in depopulating it. Australia, one suspects, would have been annexed as Canada was annexed. The US might even have joined in the German war against the Soviet Union. (If the Nazis came to power in Germany, such an invasion would been inevitable). US aid would probably have taken the form of strategic bombing. It would also have been possible that the US would have gotten involved in a land war in China to finally defeat the Communists there. Let us assume that Lovecraft dies about the time Roosevelt did, eight years later than Lovecraft did in fact. The world would then have been divided into two great spheres of influence, much as it was after the Second World War. However, they would have been far more evenly matched, since Europe would not have been laid in ruins by the Anglo- American and Russian invasions that occurred in the real world. The two empires would have had some ideological affinities, since both would have ruled by mystically-minded Aryan chauvinists. Some of their leaders would at least consider a union between the two empires. In contrast, popular opinion would have it, as did Hitler himself, that the great war between the eastern and western hemispheres would occur in the next generation. What a time for President Lovecraft to die! The only consolation would have been that the nation was be led by his brilliant young Vice President, L. Ron Hubbard. I put up the first of John's subject matter indices today: Alternative History. Since I am proceeding in roughly chronological order, most of what you see here is not yet uploaded. However, there are some pages filled in at later dates, because John intensively curated his website, and I have been following links to determine what to upload next, rather than simply going by John's publication date. I always liked John's indices. It was a fun way to revisit your favorite topic and browse. Even just now, as I uploaded this page, I realized John had reviewed two of S. M. Stirling's books that I have recently enjoyed, The Sky People, and In the Courts of the Crimson Kings. I have certainly read these reviews, but I don't remember them. It will be fun to rediscover them in time.